Act with the largest number of viewers is the winner. Anyone can view and vote. Anyone can view and vote more than once. FOSH members may enter as many new acts as they like during the contest period. 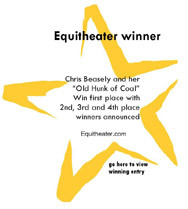 A new act is one that has not previously been entered into the EquiTheater contest. Prize money to be awarded to fifth place ($175, $150, $100, $50, $25). If fewer than 5 contestants, prize money will be adjusted. The act may consist of 1, 2 or 3 horses and exhibitors and as many props and supporting people (extras) as desired. One of the exhibitors in the act must be a FOSH member. Supporting people (extras) need not be FOSH members. The entry must be submitted by the FOSH member. All horses, ponies, mules or donkeys must be easy gaited either registered or non-registered. They may be ridden, lead or driven or any combination. The act has not been previously entered and officially accepted into the FOSH EquiTheater YouTube Contest. The act may have been recorded any time previous to or during the contest period. It is not necessary the act be recorded in public. A contestant may enter any number of acts. Music and Video must be clearly audible and visible. Video footage must be continuous and unedited. Videos must be posted on YouTube only. Winners determined by the number of Views on YouTube during the contest period. All videos submitted to a review committee for compliance. Winners will be announced prior to October 31, 2012. EquiTheater is performing a Skit, telling a story and should not to be confused with horse or horses dancing to music, a liberty routine, a pattern or rail class. The Song, Act and Costuming must all be "G" rated. (*see IJA Rules for more details and restrictions). A minimum of 2 gaits must be shown in each direction. The use of space must be balanced. The act includes at least one stop. The act includes at least one back up. Register and Create an account on YouTube. Upload video of your act to YouTube and set as “Limited Viewing”. Submit this YouTube link to the review committee at ddlittle@telusplanet.net for compliance with official act requirements. After review and approval by the committee, an entry number is issued for each act. Title your act EquiTheater_FOSH_ and the issued entry number. Change the viewing option on YouTube to “Public Viewing”. Encourage people to view the video of your act. Remember winners will be determined by the number of “Views”. The number of "VIEWS" become the number of VOTES.